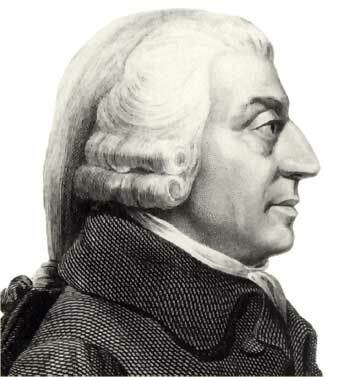 Adam Smith was born in 1723, in Scotland, is often known as the father of economics and capitalism. He is the author of “An inquiry into the nature and causes of the wealth of nations”. His “invisible hand”, “division of labour”, “management of specialization” are widely known and referred terms even. In the first chapter of “The Wealth of Nations”, Adam Smith, explains the optimum organization of a pin factory. Traditional pin makesrs could produce only a few dozen pins a day. However, when organized in a factory with each worker performing a limited operation, they could produce tens of thousands a day. This was the reason why Smith favored division of labor. 1. Increase in dexterity in every particular workman: The division of labor reduces every man’s business to some one simple operation, and by making this operation the sole employment of his life, necessarily increases very much the dexterity of the workman. 2. Saving the time which is commonly lost in passing from one species of work to another: He suggests that it is impossible to pass very quickly from one kind of work to another that is carried on in a different place, and with quite different tools. A country weaver, who cultivates a small farm, must lose a good deal of time in passing from his loom to his field, and from the field to his loom. When the two trades can be carried on in the same workhouse, the loss of time is no doubt much less. 3. Invention of a great number of machines which faciliate and abridge labour, and enable one man to do the work of many: According to Smith, a greater part of the machines made use of in manufactures in which labor is most subdivided, were originally the inventions of common workment, who, being each of them employed in some very simple operation, naturally turned their thoughts towards finding out easier and readier methods of performing it. “As every individual, therefore, endeavours as much as he can both to employ his capital in the support of domestick industry, and so to direct that industry that its produce may be of the greatest value; every individual necessarily labours to render the annual revenue of the society as great as he can. He generally, indeed, neither intends to promote the public interest, nor knows how much he is promoting it . By preferring the support of domestic to that of foreign industry, he intends only his own security; and by directing that industry in such a manner as its produce may be of the greatest value, he intends only his own gain, and he is in this , as in many other eases, led by an invisible hand to promote an end which was no part of his intention . Nor is it always the worse for the society that it was no part of it. By pursuing his own interest he frequently promotes that of the society more effectually than when he really intends to promote it . I have never known much good done by those who affected to trade for the public good“. according to Adam smith extension of the market encourages division of labor,and division of labor supports technology improvement. are these the only factor which were responsible for the increased productivity in an organization. ?